You don’t want to be worried you’re showing a mouth full of metal when you laugh. In the past, amalgam, or silver, fillings, were the only option dentists had of restoring teeth from cavities. But now we know there’s a better way — with composite fillings. The material is a safer, better way to get your tooth health back, and because it matches the shade of your tooth flawlessly, your smile stays as beautiful as ever! Learn more about tooth-colored fillings at LIC Dental Associates today. Tooth colored fillings, white fillings, composite fillings — whatever you want to call them, Dr. Saran recommends them because they offer greater health benefits and, frankly, because they just look better. Patients often wonder if replacing their silver fillings is a good idea. While the final decision is ultimately up to the patient, Dr. Saran likes to remind them of the benefits of white fillings compared to silver ones. Let’s take a closer look at the advantages of replacing your silver fillings for tooth-colored fillings. Because the amalgam material appears opaque on an x-ray, silver fillings are known to hide further decay. That means the cavity can worsen without you or your dentist even realizing it until root canal therapy or even extraction become necessary. Unfortunately, old metal fillings can cause the teeth to crack with age. This cracking occurs most commonly as the patient reaches his or her mid-40s. It’s a seriously painful issue that eventually requires significant tooth restoration. As patients become increasingly concerned with mercury exposure from their amalgam fillings, tooth-colored fillings are the safe alternative. The FDA has approved the safety of amalgam in dentistry, but many adults still prefer the mercury-free option. If you’re wondering when to replace your silver fillings for tooth-colored ones, the answer is probably right now. 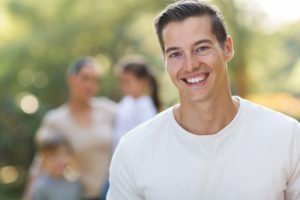 Many adults wait until they experience a problem with their fillings to have them replaced, but you don’t want to wait until tooth cracking or decay have had the chance to settle into your tooth. Early filling replacement can save you a significant amount of time and discomfort in the long run. If you’re interested in having your silver fillings replaced, contact LIC Dental Associates to schedule your visit with Dr. Saran. We’re here to help you maintain a healthy smile today, and for years to come.